Remember – We are open ALL YEAR ROUND! “I love driving in France. I got from Calais to your door with nothing more to aid me than your directions and the handy road signs that are at every junction!” Billie Sanderson. Below you’ll find tables describing the best-known methods of travel to France, with journey distances and links to the various companies. We hope you find them useful. If you do have any other questions though, please don’t hesitate to get in touch, and we’ll do our best to help you. “What a lovely relaxing, peaceful place to stay! We feel totally chilled and are sorry to leave. The gite is perfect in every way. Thankyou for a lovely welcome and recommending Le Pélican for a meal. Superb!” Jill, David & John Stratton. “Thanks so much once again for a lovely week. The fouées and ‘Pizza Hut’ are a triumph! So love the peace of this beautiful place. See you again very soon – January we hope!” Sylvia & Trevor Wheatley. Coming North from Saumur, take the D58 in Vernantes, by the Monument towards Mouliherne. Follow this road until you see the impressive gatehouse of the Chateau du Loroux, take the first right after this, opposite a farm named ‘Plaisance’. You’ll see our blue birds by the roadside, pointing our way! Follow the lane for about a mile. 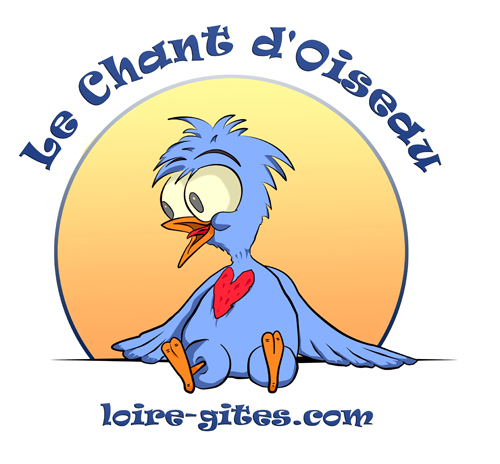 You’ll see Le Chant d’Oiseau on your right-hand side. Coming South (from Le Mans), take the D58 out of Mouliherne towards Vernantes. Take care to turn right at the fork just outside the village! Continue for some miles past a small hamlet named ‘l’Oisellerie’. Soon, you’ll see a small bus-stop and a wooden cross on your right. This is the crossroads known as ‘Croix Justicion’, turn left here, past a small cottage (It’s signposted for Le Chant d’Oiseau). Take your next right (again signposted). Pass a few farms on your left and right. In around 2 miles, you’ll see Le Chant on your left hand side! If you miss this turn, continue for a couple of km’s, and turn left opposite ‘Plaisance’, (you’ll see the two blue birds by the entrance to our lane) and we’re then on your right after a mile or so! Just type in your travel details, this is very, very accurate! Remember! If you have any problems at all, give us a call!